Made an impression on the kid. Charming story. Thing is, Lisa Rogak’s lazy, lukewarm, surface-skimming bio of this zingy pop culture personality, tells us nothing of this, other than Stewart thanking his “beloved” hero many years later. Those Springsteen lyrics? I’m just assuming these lines resonated with young Jon. Rogak doesn’t choose to go any deeper, to see what rocked Stewart’s soul – other than being the funniest kid in class and his rage at his father. More on this later. Veteran author Lisa Rogak has written a slew of books – mostly bios, quirky non-fiction stuff, even a novel. Notably a biography of Stephen Colbert – clearly, she’s got a good thing going with Comedy Central. Versatile, skilled, professional. And she’s got a great website, fizzing with personality and charm. Her site’s vintage library-card-catalog look and feel throws down a winking gauntlet, daring the visitor – just try and not like me. Hard to do. 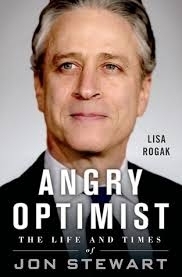 So where is all that charm, fizz and humor in this bio of Jon Stewart? He, possessed of large quantities of charm, fizz and humor, he who is welcomed nightly into all manner of digital high-def media across America, yet we’re presented with blandly mild quotes from “current and former colleagues.” Weirdly flat, maybe even a bit boring…dare I say, skimmable? Rogak is clearly funny and charming, but not here. It’s just the facts ma’am, presented in trudging chronological order. Chapter 1. Chapter 2. Chapter 3. Anyone for zippy chapter titles? Stewart is a comedian, you know. No Moment of Zen. Not even close. But that’s it. She moves on. Yes, by this time in her dreary narrative, Rogak has told us a bit about Jon’s disdain for his father who left town, abandoned the family. But how about asking, hey Jon – tell us more about that, that thing with your dad. And these books – which were your favorites? Rogak is writing a biography – isn’t she a little curious? Willing to go a bit deeper? No, nothing. Here’s the thing – she apparently had no firsthand interviews. Nowhere does the accompanying PR say anything like “with unlimited access…” or touting in depth, hard-hitting chats with her subject. Just, “drawing on interviews with current and former colleagues.” She relies entirely on secondary sources, albeit with lots of well-documented notes. What, no access to the man? About that title: Angry Optimist. Rogak begins, “Let’s get something out of the way from the beginning: Jon Stewart is a bundle of walking contradictions.” Okay, aside from my quibble with “walking contradictions” rather than “walking bundle of contradictions”, and despite my instant like of her voice—asserting that her subject is made up of contradictions is, I think, a hackneyed approach to biography. And this is the Introduction. Uh-oh. Buckle down. We’ve got a couple hundred pages to go – of folks not being terribly willing to disclose quirks. Beginning with high school. Then college. Then stand-up. And on. Or this one: Colbert is a nice guy, a rarity in comedy. But Jon Stewart? Just a guy from Jersey. That’s it? Phew. Made it to the end. Is it too much to ask for us bio readers to get a chuckle or two every, say, twenty pages or so? Springsteen and I would’ve liked that. This entry was posted on Friday, November 7th, 2014 at 9:42 pm	and is filed under Random Notes, Scribblings. You can follow any responses to this entry through the RSS 2.0 feed. Both comments and pings are currently closed.